Add ravishing colour to your outdoor space with the Variatie Red Tulip Mixture. With shades ranging from blushing rose to lush scarlet to deep crimson, these flowers offer their beauty throughout the spring months. This mixture includes Parrot, Fringed, Triumph and Lily-flowering varieties, for a stunning array of shapes and textures as well as unforgettable colours. These red tulip bulbs are hardy in zones 3 through 8 and bloom at various times throughout the spring so you can constantly enjoy new colours. 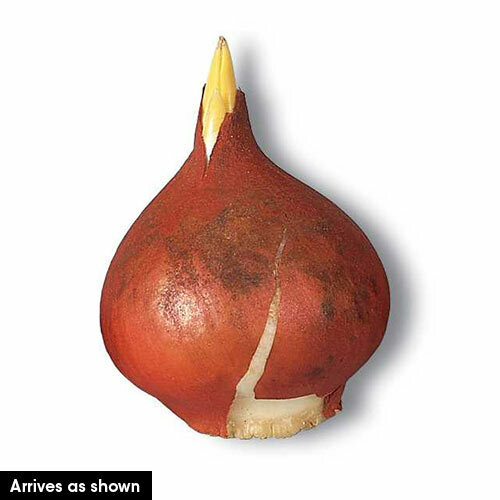 These Dutch-sourced bulbs will tolerate clay, loamy or sandy soil as long as it's well-drained. Plant your perennial tulips in the fall, about 3 inches deep and 4 to 6 inches apart. For optimal blooming, these vibrant tulips prefer full or half sun. 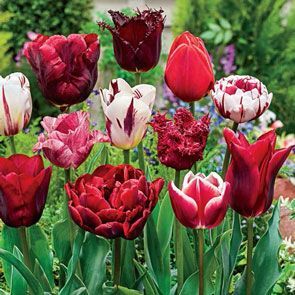 With upturned petals and breathtaking shades of red, the Variatie red tulip mixture will enhance any area of your garden.These tulipa varieties grow to heights of 16 to 20 inches, making a wonderful backdrop when paired with other red or white spring flowers. Add them to container plantings or borders and walkways for a stunning display. A striking addition to cutting gardens, their sturdy stems make them excellent for bouquets. Ensure that your garden will be noticed with the eye-catching Variatie red tulip mixture. Ravishing red blooms—all season long! A selection of our best red tulips with shades ranging from bright red to deep scarlet. This diverse mix includes parrot, fringed, triumph, lily-flowering and double-flowering varieties for an unforgettable display that will bloom at different times throughout the spring. For the best effect, plant in large groups.